Ruel-Malmaison (France), June 30, 2017 - On June 30th, Schneider Electric, the global specialist in energy management and automation, announced the acquisition of nxtControl. Located in Austria, nxtControl is a highly innovative company leading the industry in real-time control software for distributed control systems based on the IEC 61499 standard. 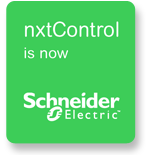 "We are very pleased to welcome on board the nxtControl team" said Fabrice Jadot, CTO of Schneider Electric's Industry Business. "Their innovative IEC 61499 programming approach will allow us to address the future requirements of the Industrial IoT and Industry 4.0, and as such it will be a key technology of our EcoStruxure architecture." We provide integrated efficiency solutions, combining energy, automation and software. In our global Ecosystem, we collaborate with the largest Partner, Integrator and Developer Community on our Open Platform to deliver real-time control and operational efficiency.